Size: 7" x 9" x 1.25"
Condition: Near Mint, 507 pp. includes index. PHP is everywhere. In its February 2004 Web server survey, Netcraft [www.netcraft.com] poked 47,173,415 domains and found that 15,205,474 had PHP installed. That is approximately 32 percent of all domains on the Web, and there is no sign of its slowing down. 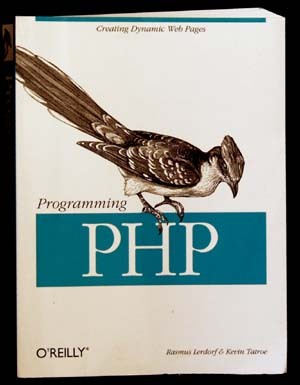 I started developing PHP nearly 10 years ago now. That was long before the term "Open Source' was coined and before the GPL and Free Software was well known. And as with many open source projects that have gone on to become popular, the motivation was never philosophical or even narcissistic. It was purely a case of needing a tool to solve real-world Web-related problems. In 1994 the options were fairly limited when it came to Web development tools. I found myself writing dynamic components for Web sites in C or Perl, and the code overlap from one problem to the next was quite significant. For performance reasons, I was increasingly tending away from Perl and toward C, because the fork+exec overhead of having to run Perl as a standalone CGI was too restrictive. The initial unreleased version of PHP was mostly a C library of common C functions I had written to be easily reusable from one open source project to the next. I had a simple state-machine-driven parser that picked tags out of HTML files and called the back-end C functions I had written. This code was initially released to the public as a package called Personal Home Page Tools, and each tool in the package was an example of how to use the system to solve a common problem on a personal home page. - From Rasmus Lertorf "The Hitchhiker's Guide to PHP"